Forncett St. Peter postmill was an open trestle mill powered one pair of 4ft 6ins and one pair of 5ft French burr stones, a stripping cylinder and a flour mill. A nearby bake office was run in conjunction with the mill until it was sold off separately. The mill was known as Tacolneston mill and was later moved a short distance to the south to its last working position in 1824, where it became known as Forncett End black mill. A WINDMILL in Forncett St. Peter commonly called TACOLNESTON MILL with two Pair of Stones, well winded & gisted, & a fullsized Flour Mill which goes by the wind. Also a Dwelling House & Stable, Hayhouse & other Conveniences, with Half an Acre of Pasture Land adjoining. For further Particulars enquire of John Durrant of Forncett St. Peter the Occupier & Owner. First. The present Turnpike Road from Norwich to New Buckenham. Second. One other Piece Road being the present Road leading from Forncett to Wymondham branching out out of the said Turnpike Road at the Distance of about two hundred and ninety yards from the Bounds of Forncett and proceeding in a North West direction near to the Windmill belonging to James Blomfield and from thence nearly in a North Direction until it enters the Bounds of Fundenhall. Fifth. 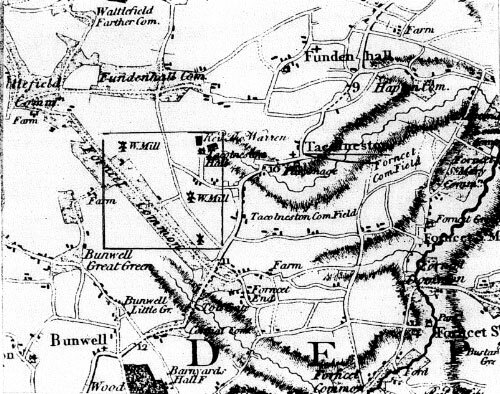 Also one other Road branching out of the Second Road at the disatance of about one hundred and forty yard from the Windmill belonging to James Blomfield and proceeding in a South West Direction until it enters the Bounds of Forncett. At the White Swan, in Norwich, on Saturday the 15th Day of March next, between the Hours of Eleven and Two in the Afternoon, subject to such Conditions of Sale as will then and there be produced, unless before disposed of by Private Contract, of which timely Notice will be given in this Paper. An Estate in Forncet St Peter, in Norfolk; consisting of a capital Messuage, with a Garden and Orchard well planted with Fruit Trees, Baking-office, Malting-office, with a twenty-five Comb Steep, Store Rooms, and other convenient Buildings; and contiguous to the Dwelling-house there are six Acres of exceeding good rich Pasture and Arable Land. The Buildings are in excellent Repair, having been lately rebuilt, and the Situation is remarkably eligible for carrying on the Baking and Malting Business, there being a Vacancy for a Person in those Branches. -- Also a very good Windmill in Forncet St Peter, with a Cottage, and about an Acre of Land adjoining. -- Also a Freehold Messuage and Garden of Land adjoining. -- Also a Freehold Messuage and Garden in Forncet St Peter, in the Occupation of Francis Osborne. For further Particulars apply to Mr Gamaliel Ransome, at Wymondham, of Mr Ives, of Coltishall. An ESTATE in Forncett St. Peter in the county of Norfolk, comprising a capital Messuage with a Garden & Orchard well planted with choice Fruit Trees, Baking & Malting Office with a 25 Comb Steep, Store Rooms & other convenient Buildings contiguous to the Dwelling House & 6 Acres by Compilation of Arable & Pasture Land thereto belonging. Also a capital compleat POST WIND MILL with two Pair of excellent French Stones; one four Feet & a half & the other five Feet diameter, with stripping Cylinder, Brasses & Going geers thereto belonging. The Buildings are all in exceeding good Condition, a great Part thereof having been rebuilt & the remaining Part put into thorough Repair but a few years since & the Wind Mill rebuilt within twelve months. Enquire for further Particulars of Mr. Thomas Burton of Wreningham, Mr. James Smith of Hardingham, Mr. John Burton or Mr. Phillipo, both of Carleton Rode in Norfolk. At the George Inn in New Buckenham on Thursday 3rd Day of August next at 3 o'c in the Afternoon. Lot 1. All that Estate in Forncett St. Peter consisting of a capital Messuage comprising a capital Messuage with a Garden & Orchard well planted with choice Fruit Trees, Baking & Malting Office with a 25 Comb Steep, Store Rooms & other convenient Buildings contiguous to the Dwelling House & 6 Acres by Compilation of Arable & Pasture Land thereto belonging. Also a capital & compleat POST WIND MILL with two Pair of excellent French Stones; one four Feet & a half & the other five Feet diameter, with stripping Cylinder, Brasses & Going geers thereto belonging. The Buildings are all in exceeding good Condition, a great Part thereof having been rebuilt & the remaining Part put into thorough Repair but a few years since and the Wind Mill rebuilt within twelve months. Estate at Forncett St. Peter in the county of Norfolk, comprising a capital Messuage with a Garden & Orchard well planted with choice Fruit Trees, Baking & Malting Office with a 25 Comb Steep, Store Rooms & other convenient Buildings contiguous to the Dwelling House & 6 Acres by Compilation of Arable & Pasture Land thereto belonging.